We have two apple trees in our garden. They were planted on our garden building day in April 2013. When the holes for the apple trees were being dug, we were concerned that the ground was too hard and didn’t look like it had many nutrients. We planted them anyway and made sure that we dug the hole larger than needed so that we could add some new compost and soil. To our surprise they did very well that year (other than the aphid issue). That winter, we didn’t realize that we had to prune them so in their second year they grew quickly and got very weak. Their branches didn’t thicken enough to be stable. We also don’t think that they got enough water during the summer. 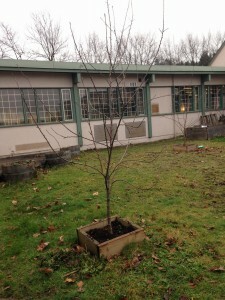 We made it a goal to do research and learn how to better care for the apple trees so that they can get strong again. I began reading the book Grow Vegetables in Pots and found a lot of information and techniques on apple trees. I also watched a few pruning videos which taught me a lot. The only thing that we’re not quite sure about is if the trees we have are tip bearing or spur bearing. The difference between these to is that tip bearing apple trees bear their fruit at the tip of their branches (like the name states) while spur bearing apple trees hold their fruit on the short side shoots. We aren’t too concerned with growing fruit this year—we’d rather have them use their energy to grow stronger. When it gets warmer the trees begin to bud so its best to prune them in the winter months. As its winter right now, I have been pruning ours. When you’re pruning an apple tree you want to keep in mind that you are shaping the tree. You don’t want to allow the branches to grow too low to the ground for two reasons: firstly, you don’t want your fruit to be growing so near to the ground, and secondly the branches are easily damaged. Its best if all of the branches grow out away from the tree–if you let them grow in every direction there will be too much happening. You have to prune to the bud, and you want and keep in mind that whatever direction the bud is will grow into a branch–will it grow into another branch, or out into the clear? An important note to remember is that you want to make clean cuts. If the tool you are using is not allowing you to do this, then you are not only using the wrong tool but you are damaging the tree and it will be hard for it to recover. To help the trees with growth and future fruit production, they need regular watering and extra nutrients (fertilizer or other). When it comes to nutrients there are many things that can be done. One of the most suggested things is slow release fertilizer, but there are also many other techniques to ensure that the apple trees have enough nutrients. Removing extra shoots and thinning any stems that may become congested will also help a lot. Once fruit starts growing, you want to thin the apples—you don’t want large bunches. If you limit the amount of apples that the tree is putting its energy into this will make the remaining apples bigger and better.